Your Super Solutions. Helping you with smsf rules and regulations. What is a SMSF and how would it benefit me? Self-managed super funds (SMSFs) allow people to control their own super investments for their retirement. If you set one up, you’re responsible for running it in accordance with the law and reporting to the ATO on its operation. Lower fees on average than industry and retail funds. Generally better performance than industry and retail funds. Opportunities for insurance cover within your SMSF. Estate planning opportunities within your SMSF. You generally need to have a significant amount of superannuation to benefit from a SMSF. On average we would suggest a minimum of $200,000 is needed, with a view to building your super with ongoing contributions. However, it would depend on your particular situation and stage in life as to whether a SMSF would benefit you. Call Juanita Sharp or Adam Passwell for more information. What are the five main areas of SMSFs? Hales Douglass & Your Super Solutions can help you with your entire SMSF journey, seamlessly integrating the 5 main areas above. Need more information? Call Juanita Sharp or Adam Passwell. SMSF administration is an annual regulatory requirement. You need to keep accurate accounting records and explain transactions and the financial position of your SMSF each year to show that you can remain a complying superannuation fund according to the SIS Act (Superannuation Industry Supervision) and continue to enjoy the tax concessions superannuation offers. ATO fines do apply for non-compliance to SMSF administration regulations. With this in mind, it’s best to choose a provider who has experience in the industry and keeps up-to-date with the ever-changing regulations, which Your Super Solutions does. Not only is it important to tick the compliance boxes, our experience has alerted us that some providers, who may not have extensive knowledge of complex tax and the industry in general, are inadvertently structuring clients funds incorrectly. The result is clients are losing thousands of dollars of their hard-earned super. Juanita Sharp can be contacted for more information. How can our SMSF Investment Strategies help? Whether it’s helping to manage your whole SMSF investment strategy, co-managing your investments or just adding some specific advice in areas you need help. Hales Douglass Financial Services is able to tailor an investment strategy to suit your SMSF needs. A Hales Douglass Financial Services adviser can share with you our philosophy in greater detail. But it is not just our thinking that matters. How we apply our thinking is what makes a difference at the end of the day. Working with a group like Hales Douglass Financial Services provides you with the opportunity to consider your investment needs. No two investment plans are exactly the same. That’s why seeking advice is so important. To talk to us about this, call either Adam Passwell or Andrew Clegg. How can I get the best outcome from my SMSF investments? One of the most important issues in the world of SMSF is the ability to create and implement a well defined, well thought out, prudent investment strategy for the Fund. The most common mistake is investors tend to look straight to what specific investments they want to make (e.g. which shares do I buy) instead of starting with a more broad based 'top down' approach which enables a range of factors to be considered before you get to the actual investment selection. This is where a sound, well-researched investment philosophy and implementation process really set the ground work for achieving best outcomes for SMSF investments. Do you have a written investment philosophy? Adam Passwell or Andrew Clegg are here to help you find out more. What types of investments are not permitted in a SMSF? All SMSF investments must be made and maintained on a strictly commercial (i.e. arm’s length) basis. No Loans to members and relatives - The trustees of a SMSF must not intentionally acquire assets from a ‘related party’ of the fund. There are some exceptions to the above rule for acquiring related party assets, including: listed shares, business real property. An investment, lease or loan that is an in-house asset is not prohibited, but is limited to 5% of the market value of the fund’s assets. Call Adam Passwell or Andrew Clegg with any further questions you may have. What are the Investment strategy regulations? An SMSF trustee must now 'review regularly' the fund's investment strategy; and as part of the investment strategy, an SMSF trustee must now consider whether to hold a contract of insurance for one or more members. Adam Passwell or Andrew Clegg are available for more information. What are the new asset regulations? The ATO require SMSF trustees to keep money and other assets of the fund separate from any money or assets held by a trustee personally. SMSF assets to be valued at their 'market value' when accounts and statements of the fund are prepared. Please email or call Adam Passwell or Andrew Clegg. What is a SMSF Audit? As the trustee of a SMSF you have a responsibility to appoint an approved auditor to audit your fund each year. A good quality audit will first and foremost provide comfort that your fund is complying with the law. If your fund is deemed non-complying it could have to pay 45% of its assets to the Tax Office. This is generally a cost which makes the risk of non compliance far too great to take. A good auditor will also help you correct errors, proactively manage emerging issues and assist you in negotiating your way forward with the tax office. David Howells will be able to provide more information on request. Who is an approved SMSF auditor? An approved auditor must be either registered as a company auditor with ASIC or a member of one of the professional accounting associations (Chartered Accountant, CPA or NIA members). To find out more about this, call or email David Howells. Can my accountant audit my SMSF? Although your accountant could be qualified to perform your audit, the Auditing and Assurance Standards Board has stated that an accountant cannot perform both the accounting and audit of an SMSF and remain independent. The Tax Office will be targeting funds for review whose accountant also provides their audit services, with this information now required to be disclosed in Part I of your annual return. Smaller accounting firms must arrange for client SMSF audits to be done by a third party. Relatives or other business associates of the accountant are also prohibited from auditing accounts prepared by the accountant. Call David Howells about this if you need more information. How can I save time & money with my SMSF audit? The key to a low cost and no fuss audit is communication and well-organised documentation. If you are unsure of something discuss it with your auditor or SMSF accountant beforehand. Make sure you aren’t missing anything. If you are, then track it down before it gets to the auditor. David Howells is available for more information. For each income year, SMSF trustees must appoint an approved SMSF auditor to perform a financial and compliance audit of their SMSF's operations before they lodge their self-managed superannuation fund annual return (SAR). Have an SMSF auditor number (SAN). From 1 July 2013, the SAN must be included on the SAR or lodgement of the SAR cannot be accepted. In addition, a registered approved SMSF auditor must now be appointed not later than 45 days prior to the due date for lodgement of the SAR, instead of not later than 30 days prior to that date. See regulation 8.02A of the Superannuation Industry (Supervision) Regulations 1994. A breach occurs when a fund fails to comply with the Superannuation law. Juanita Sharp can help you find out more. Call David Howells to find out more. What are my responsibilities as a SMSF trustee? Considering insurance for both fund assets and members. Prosecute in the most serious cases. Contact Juanita Sharp or Adam Passwell for assistance. Why is it crucial to organise Estate Planning within your SMSF? 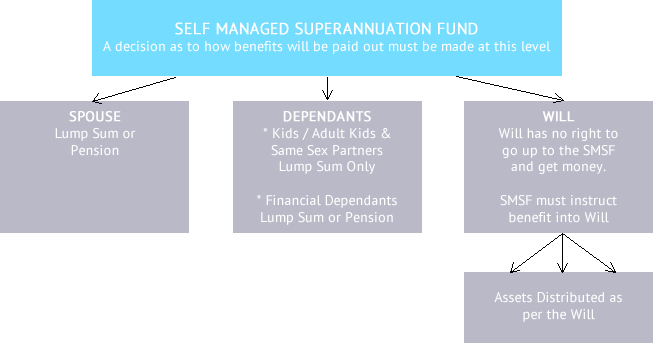 For many people, superannuation benefits form the largest part of their estate. With recent changes to the taxation and superannuation laws allowing the passing of tax effective wealth between generations via a SMSF, estate planning in a SMSF is now an important and crucial area to be considered by all members and trustees of a fund. Contact Adam Passwell for assistance. I have a Will. Won’t this cover the distribution of my superannuation as well? Wills are completely ineffective when disposing of superannuation benefits on their death. They wrongly assume that because they have made provision for the passing of their superannuation benefits in their Will, that this will happen. What happens if there is no Death Benefit Nomination? If the member does not make a Superannuation Death Benefit Nomination then the trustee has the discretion to determine where a deceased member‘s death benefits are to be distributed. What is a Non-Binding Death Benefit Nomination? This type of Death Benefit Nomination allows members to nominate who they would prefer to receive their super death benefits in the event of their death. Superannuation Death Benefits can generally only be paid directly to a deceased member’s dependants (as defined in superannuation law) or legal personal representative. However, whilst fund trustees take a non-binding nomination by a member into consideration, they must be satisfied that all of the deceased’s possible dependants are considered when the trustees make a decision about who should be paid a death benefit. This type of Death Benefit Nomination is a legally enforceable nomination requiring a fund trustee to pay superannuation death benefits to the dependants nominated on a fund member’s binding death nomination form. Members can only make a binding nomination to pay their superannuation death benefits to their dependants (as defined in superannuation law) or to their legal personal representative. What are the benefits of a SMSF Will? A SMSF Will allows members to maximise the tax efficiency of their SMSF estate leaving specific benefits to dependants, non-dependants and legal estate. It allows your executor to take your place as trustee of the fund on your death until your SMSF Will is carried out. Furthermore is allows for members to pay out specific assets of the fund to beneficiaries, much the same as a specific bequest in a Will. How should my Estate Planning and Will be structured?